The Mount Allison women’s curling team participated at the U Sports-Curling Canada championships from March 15 to 19 in Fredericton, N.B. They competed against seven other teams and stand in sixth place out of a seven-game championship. Jim Nix has been the curling team’s head coach for four years. This is his second year in a row making it to the championships with the team. Despite an unconventional start to their season – where they were sitting at 1-3 after four games in a five-game round robin – the team was able to make it to the Atlantic University Sport (AUS) playoffs. During the playoffs, the team won the semifinal game leading them to finals, securing their spot at the U Sports championships. “They struggled for sure but were not deterred at all,” Nix said. Nix mentioned that in addition to being strong and supportive of each other, the women’s curling team has other assets that have helped them in the championships. “[We] have a wealth of experience at many levels, in the case of Sam and Julia, which greatly helps when you are involved in tight games, as we expect all our games to be [during the championships,” Nix said. 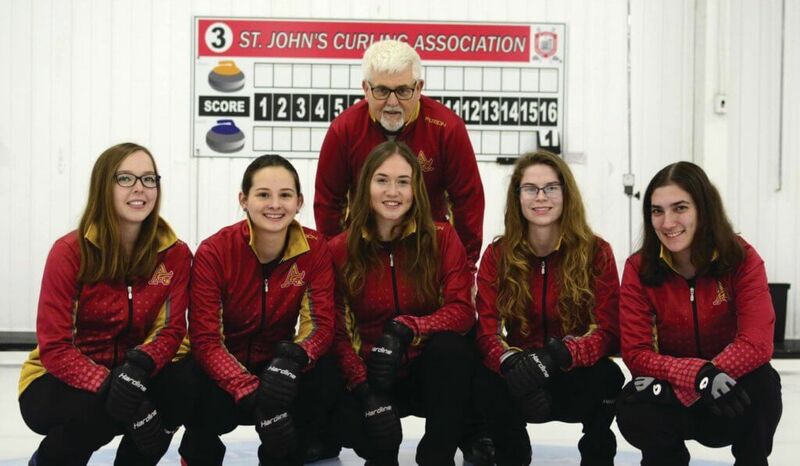 Julia Hunter, a fourth-year commerce student, is playing her fourth year on the women’s curling team. She mentioned that in addition to the training done with the Mounties, some of the players trained together to get ready for the U Sports championships. “Molli, Sam and I curl together outside of the University, so getting to keep that lineup when we play for [Mt. A] makes us that much stronger,” Hunter said. “It is difficult to ensure wins on the ice, but we can guarantee that we play hard and do the best we can,” Nix said.